This is a very common pest in the urban landscape in some areas. In the summer of 2009, there was a serious epidemic in some Red Deer neighbourhoods, but populations declined greatly in 2010, most likely due to a cold, wet spring, and generally cool summer. As of 2016, leafminer has become an increasing problem in the Calgary area, particularly in the deep Southeast neighbourhoods, such as Mackenzie Towne, Cranston, and Mahogony. Birch leafminers are sawflies, jet-black, wasp-like insects that are about 3.5mm long with a 7mm wing span. They overwinter as larvae in the soil and pupate in the spring. Adults mate and begin egg laying, on the leaves, in mid-late May. Larvae enter the leaves and feed on the inner leaf tissue, leaving the characteristic skeletonized, brown patchy leaf. Last I heard, there are up to 5 different species of birch leafminers, with a potential for 9 generations per season! That’s a lot of potential damage to your birch trees. Leafminers won’t kill the birch tree. Repeated attacks, year after year, will weaken the tree however, leaving it stressed and open to attack by other insects, such as bronze birch borer, a much more serious pest that will ultimately kill the tree, usually over the course of several seasons. 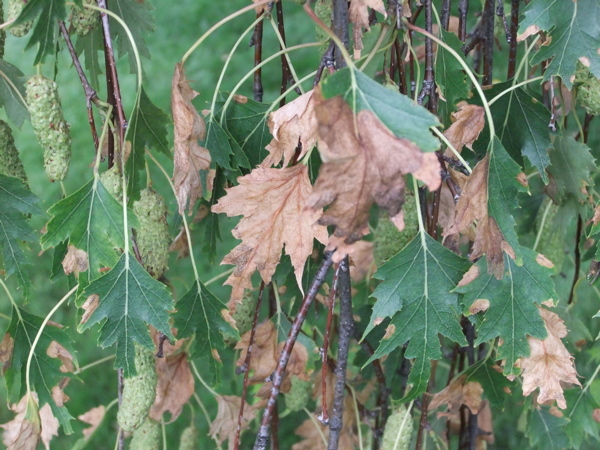 Also, leafminer attacks leave the tree looking brown and sick, which hardly adds to the esthetic appeal of your yard. TreeAzin – this is a systemic trunk-injection chemical, formulated with azadirachtin, an extract of neem tree seeds. It is injected in late May, when the leaves are expanding. Orthene – this systemic chemical is applied as a foliar spray, which is highly effective, but much more toxic than TreeAzin. Orthene is suitable for commercial areas, acreages, or large yards where drift onto neighbouring yards can be avoided. Both chemicals are most effective when applied annually. There are parasitic wasps that prey on leafminer insects, which may be helpful in keeping leafminer populations in check. Keep your birch trees healthy. Give them a good soak, throughout the dripline, during extended hot weather. Don’t over-fertilize as this has been shown to exacerbate insect problems.